Ben and Jerry, purveyors of ice cream treats, do not give a single fork about your New Years resolutions—at least, not the ones that have to do with abstaining from sweets of any kind. It’s only January 9, and they’ve already rolled out two new flavors of Pint Slices, those single-serving-sized, chocolate-encased goodies seemingly tailor-made for impulse purchasing or inhaling when one has the munchies. Thanks, fellas. Very helpful. 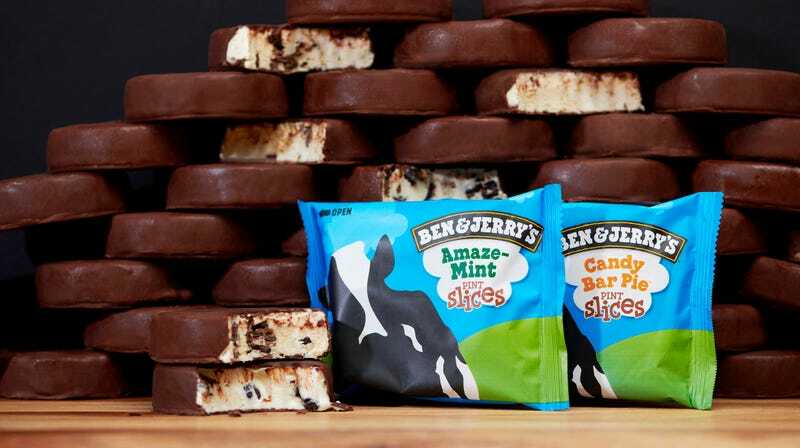 The first flavor is AmazeMint, which features “cool mint cookie balls covered in dark chocolate, and cookie crumbs.” So, basically a giant, cookie-filled Andes mint. The second Candy Bar Pie, which a press release describes as a “sweet-savory mix of fudge flakes, peanut butter, and salty pretzels.” With the addition of those two, the total flavors you can get in Pint Slice form swells to nine: Cherry Garcia; Coffee,Coffee BuzzBuzzBuzz; The Tonight Dough; Americone Dream; Chocolate Chip Cookie Dough; Chocolate Fudge Brownie; Vanilla Peanut Butter Cup; and the two new kids on the block. They come in three-count boxes, so you can stress-eat three different times. If Candy Bar Pie sounds familiar, that’s because this isn’t its first rodeo. It’s a flavor that was resurrected from the flavor graveyard, the literal-and-metaphorical space where Ben & Jerry’s pays tribute to flavors gone by.